(Affiliate links have been included in this article for your convenience. You can read more about this site’s sponsors and affiliate usage here). 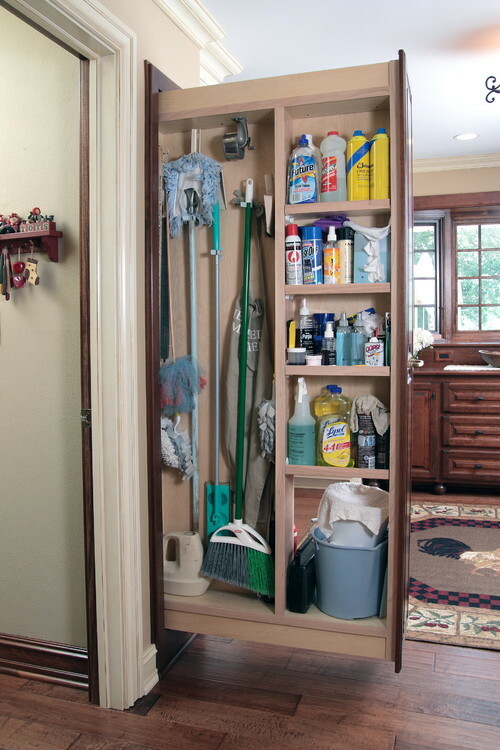 A broom closet is the best way to go, if you can afford to dedicate a little space for this type of storage. When using a canister vacuum, a vacuum hose hanger can come in handy. It keeps the hose out of the way and makes it possible to utilize the space more efficiently. 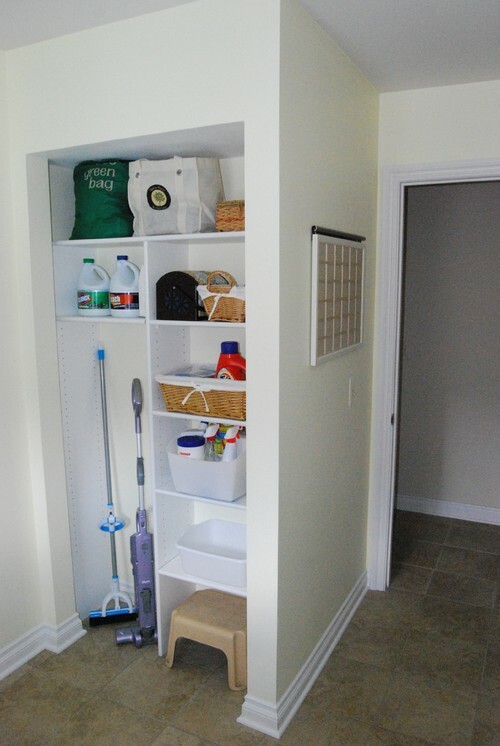 If you have an extra closet that can be dedicated to cleaning supplies that is a great idea, as well. 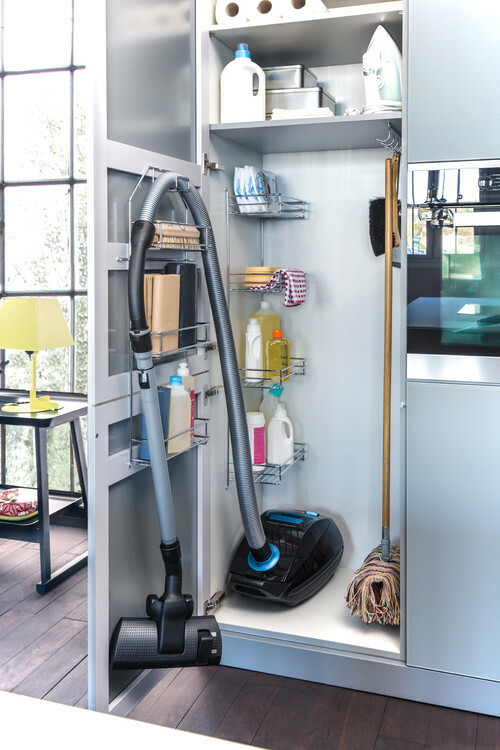 Consider adding shelves to isolate the vacuum and to provide plenty of storage for other supplies. 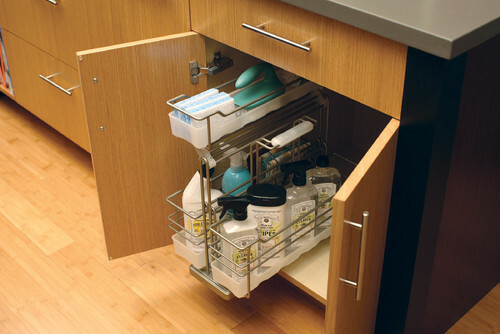 Even a recessed space can be turned into a solution for cleaning supplies’ storage. 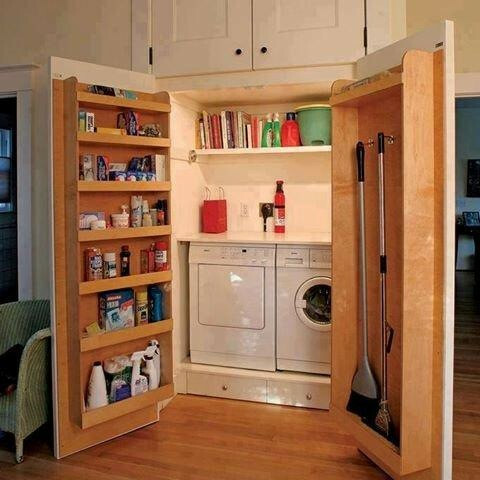 If you do not have an extra closet, consider purchasing a storage container to create storage. If you add crown molding and base trim, even a plain white cabinet can be turned into an attractive addition to the decor. Don’t forget about that space that you can’t see – the space that is located behind the sheetrock and between the studs. 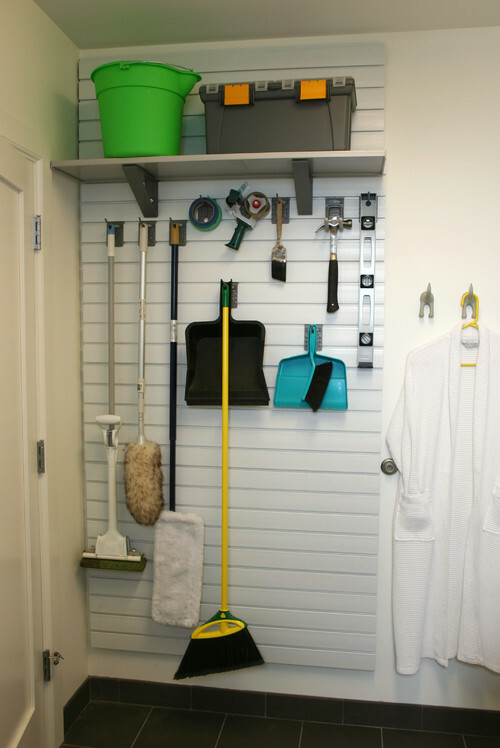 All it takes for a broom closet is the 4″ of space hidden in your walls. 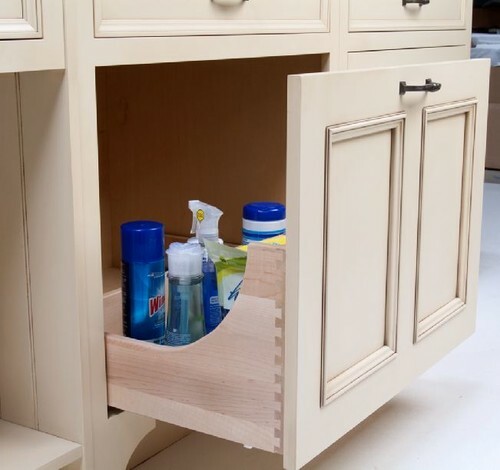 A recessed cabinet space is perfect for creating your own storage for cleaning supplies. 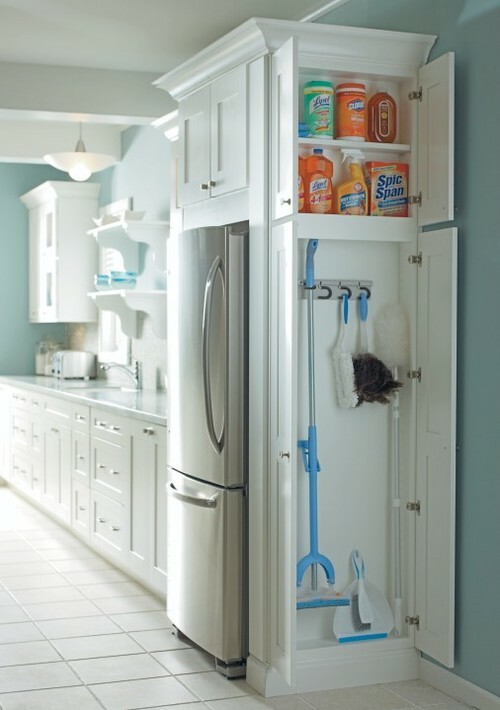 Another good place to hide away the brooms is at the end of the refrigerator. 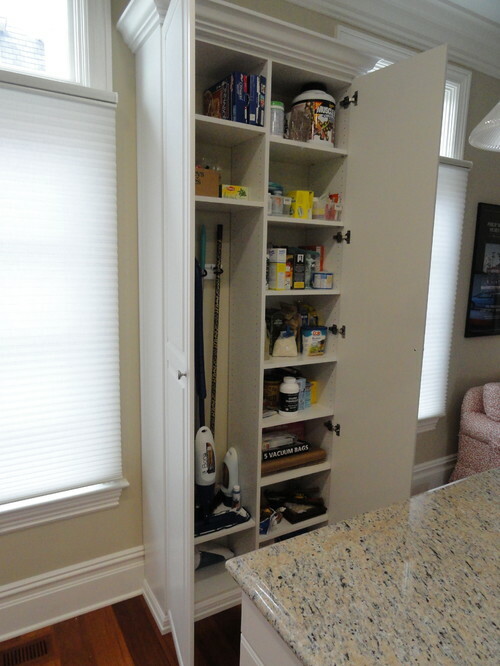 Most layouts have enough room to add an additional narrow cabinet. (Some great mop and broom hangers can be found here at Amazon). Again, the walls can provide a lot of under utilized space. 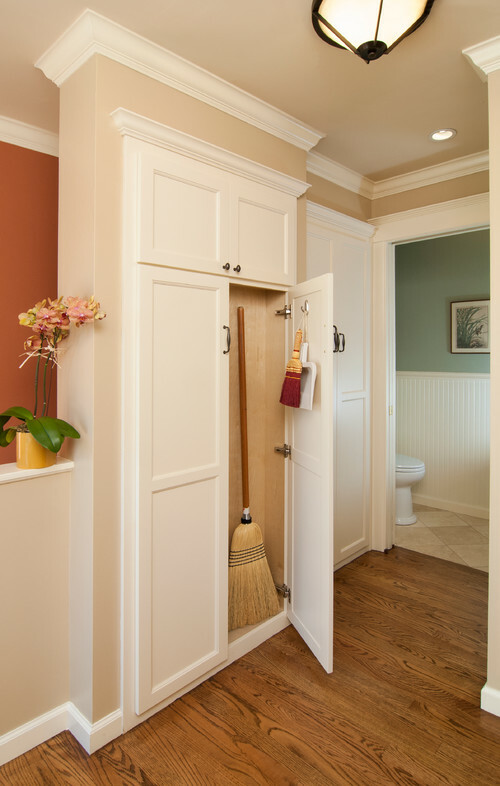 Instead of a cabinet recessed into the stud space, you may have the option to create something like the above image – a pull out tucked into the wall between the hallway and the kitchen. Also consider using slat wall systems to provide vertical storage. To see a good alternative to the expensive slat walls, check out the slat wall system that I built in my craft room (for just $8). Don’t forget about those doors. 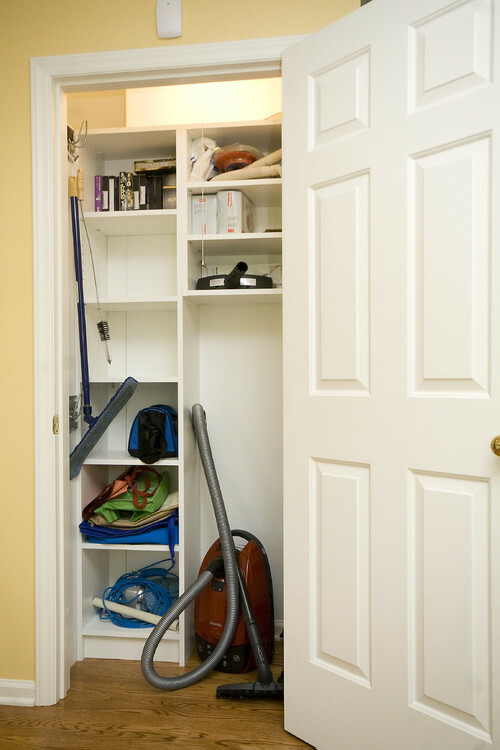 You can always add a storage compartment to the interior of a utility closet’s doors. 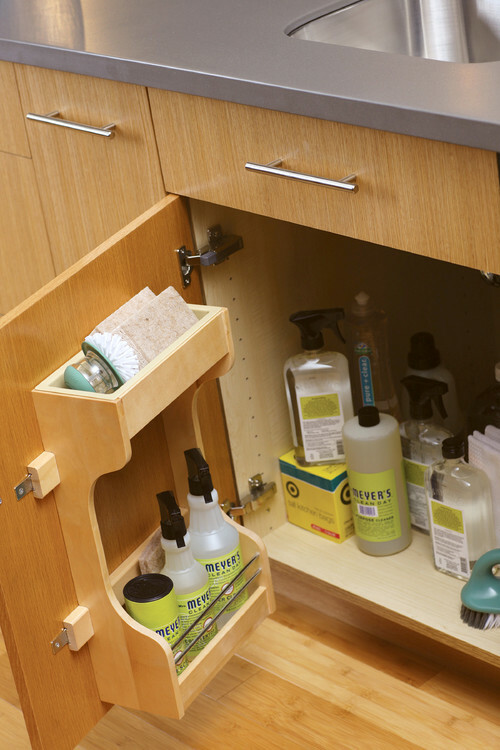 The most common area for storing cleaning supplies is beneath a cabinet. The problem with that is that it can become very cluttered and difficult to use. To make it easier, add a pull out basket. (A similar basket like this can also be found here at Amazon). If you need a lot of drawer space, consider converting a closet into a full length set of pullouts. 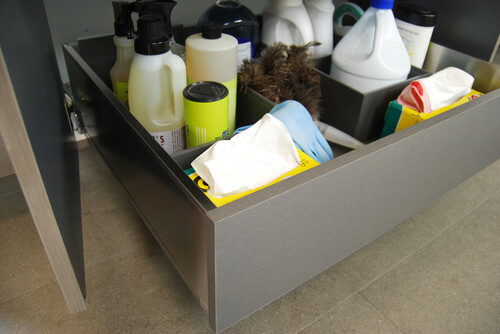 Converting those cabinet doors into a pullout can work just as well for a storage compartment as it can for a trash bin. 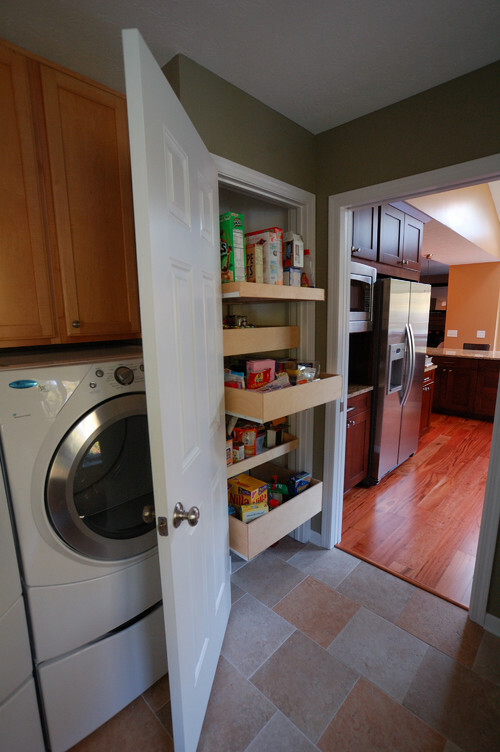 A really easy way to make access beneath a sink easier is to add storage to the inside of the doors. These are fairly easy to make if you have any construction skills, but if not these can also be purchased. (Buy it here).